Over the next 8 weeks I intend to post a blog each Sunday detailing the reasons why Britain will be better off outside the European Union. 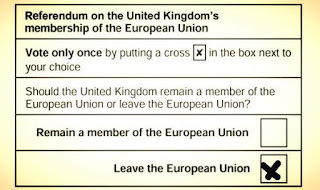 These posts will cover the following topics: the economy, influence, democracy, security, the environment, cost, and reform, but beginning this week with a rough overview of why I shall be voting Leave on the 23rd June. I got into politics when I was about 14 or 15 years old, and not for any ideological reasons. I used to listen to the likes of The Now Show and Dead Ringers on the radio at the weekend and I merely read the news in order to get the jokes. The side effect of this was my becoming interested in current affairs and, for as long as I've been engaged, the issue of the EU has been one that has garnered the most attention for me. I confess, like most 15 year olds, I didn't really have a clue what I thought or what the issues were. Much of my viewpoints were probably a combination of received wisdom, my dad's influence, and a general vibe picked up from the stuff I read in the news and indeed what I heard on Radio 4 comedy shows. However, I've always been what you would call a Eurosceptic, believing that the EU did more harm than good and was too meddlesome in UK affairs. Whether it be ridiculous stories of outlawing bendy bananas or indeed the impact of immigration, I rarely agreed with EU policy. Interestingly though, as my political beliefs have developed, changed, and (I hope) matured, my opposition to Britain's EU membership has gone from being a vague sense of disdain fuelled by wild (and often inaccurate, as the bendy bananas story was) tabloid journalism to a firm belief that far from being a benign nuisance, the EU is actively harmful to both it's member state's prosperity and, more importantly, to democracy itself. Whilst it may have been formed with noble intentions, bringing the previously warring nations of Europe together to trade and co-operate, it has morphed into a bureaucratic nightmare. It is no longer a free trade area but a protectionist customs union, marching inexorably along the path to a federal United States of Europe, with a common government, common army, common currency and fiscal policy, common foreign policy, flag, anthem, and all the other trappings of statehood. The people of Europe have rarely been consulted about this plan, and when they have, they have been routinely ignored, the EU swatting aside unfavourable referendum results and forging ahead regardless. Indeed, this anti-democratic nature is bred into the very way the EU is structured. Whilst we may vote for our MEPs, the European Parliament has no power to introduce, repeal or amend legislation. 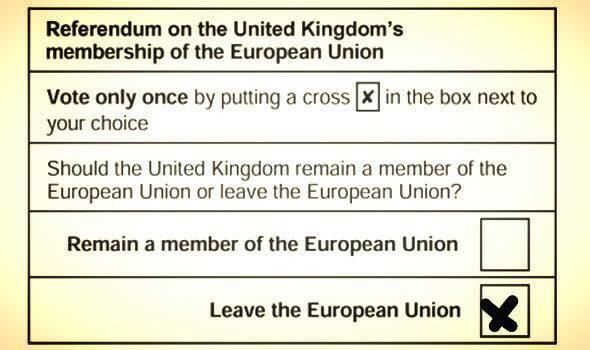 This is all done by the European Commission, an appointed body, not elected. The fact that people have power to introduce laws that affect us all and yet are completely unaccountable to the electorate should be enough of a reason for anyone to vote to leave. This is, of course, all done in the name of peace and prosperity, but the EU is the slowest growing market in the world and is continuously shrinking as a share of global GDP. This would be of little consequence were it not for the fact that it's members cannot negotiate trade with the other emerging economies of the world, bound as they are to the EU's common trading position. In today's rapidly changing, global economy, it is not large trade blocs that are best equipped to strike deals, but smaller nations, more easily adaptable to the prevailing economic winds, and better suited to pursue their own interests without being compromised by competing interests in the same bloc. As for peace, one need look no further than the terrorist attacks carried out by ISIS fighters arriving under the guise of the refugee crisis, the rise of far right parties across the continent, or the civil unrest in places like Greece and Spain to see how laughable a proposition the EU fostering unity is. Despite what the Remain camp profess, it is possible to leave the political institutions of the EU and maintain access to the single market. The European Economic Area runs all the way from non-EU Iceland to non-EU Turkey and leaving the EU to rejoin the EEA via the EFTA (European Free Trade Area) will negate any negative economic effects of withdrawal. From this position we can maintain our trading relationship with our neighbours in Europe whilst forging new trade links with the other emerging economies of the world, and crucially, take our place at the top tables of world trade, helping shape global trade regulations before they are passed down, and indeed watered down, at EU level. As the 5th largest economy in the world, a permanent seat holder on the UN Security Council, a nuclear power, and a leading member of the G8, linked by history, language, common law and culture to every continent on the planet, freed from the shackles of EU membership, we can wield our substantial influence on the world stage rather than being marginalised in the corridors of Brussels.